The Clinical Evaluation begins with the development of a custom survey by a member of our staff. Then, the product and survey are sent to a randomly selected group of 20-30 of our 250 Clinical Consultants. The Clinical Consultant and their staff integrate the product into their daily routine, use the product regularly over a given period of time and then complete the survey. Once the completed survey is returned (we have a 95% survey return rate!) 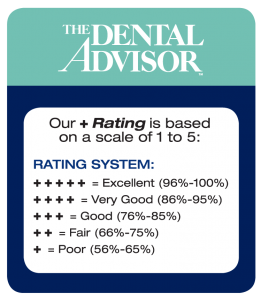 to THE DENTAL ADVISOR, an editor compiles the data from the surveys and writes an article for publication. The article is brought before our Editorial Staff at our weekly Editorial Meetings, where the product, plus rating, and clinical percentage rating are discussed and debated. This effort culminates into the final published article, plus rating, and clinical percentage rating. Contact your Account Manager for more details and pricing. Tests may include evaluating the bond strength of dental adhesives and the mechanical and physical properties of resin composites, dental cements, and impression materials. Special evaluations of dental equipment and devices can also be performed at this facility. Long-term clinical evaluations provide our readers with information that matters. Marginal staining, postoperative sensitivity, wear, and esthetics are just some of the performance variables we can follow over time. Each long-term clinical evaluation is designed specifically for your product. THE DENTAL ADVISOR can advise you on product instructions, packaging, ease of use, laboratory properties, and other areas of interest in a confidential manner. These evaluations can occur at the R&D stage or before product introduction. Our group of experienced practitioners, educators, scientists, and auxiliary staff members can provide you with critical, customized information to help ensure the success of your product before you launch your product on the market. Each custom evaluation and laboratory study is designed specifically for your product. If you have an idea or are interested in a specific test, we will create a custom proposal to address your needs. Download The Dental Advisor Media Kit (PDF) or contact your Account Manager for additional information and pricing. Small research projects completed at THE DENTAL ADVISOR Biomaterials Research Center or at universities or independent test facilities will be considered for publication in THE DENTAL ADVISOR Research Report. For consideration, submit a one-page manuscript containing the following information: purpose, materials and methods, results with data in a table or bar graph, and conclusions. Upon receipt, the editorial staff will review your submission, and if accepted, will edit and format the information for publication on the web site. Clinical Cases completed at Enspire Dental or participating consultant offices will be summarized and highlighted for publication in THE DENTAL ADVISOR Clinical Case Report. Each report will provide information on proper case selection, and step by step technique photographs and text. Clinical tips may be provided for the reader, and upon completion are available on our website or as reprints.